A few updates for our Custom Payment Forms: Required Fields Name, Email, and Phone are always required. Customer comments can be disabled, allowed, or required. Organization Info Organization info is now displayed as a “footer” on the bottom of the form. This is the public info provided on your account configuration page. Accepted Card Logos We have added the logos for the credit cards that we accept. As a reminder we use Stripe to process all payments on Paycadence. At this time Stripe accepts Visa, Mastercard, Amex, Discover, JCB, and Diner’s Club. Security Badge To improve customers confidence we have added a small security badge underneath the Payment button indicating our Secure SSL Encryption. We have added a few new features to our invoices: Invoice Service Charge Recently we added a service charge capability to our custom payment forms (Learn More Here). Now we have also added this feature to our invoices. It is an optional service charge added to the total amount of the invoice. The service charge can be used to recoup all or some of your transaction fees. If a the service charge is enabled on an invoice, a note will be added to the invoice email sent to the customer mentioning that a service charge will be applied to online payments. The invoice payment form will display the original invoice total, the amount of the service charge based on your settings, and also the new total which includes the service charge. View Invoice Email You can now view a copy of the emailed invoice so you know exactly what was sent to your customer. Delete Invoice Invoices can now be deleted completely. The ability to cancel an invoice still remains. Canceled invoices remain in your invoice records, while deleted invoices are removed. Ability to Pay Invoices Offsite We have upgraded our invoicing system so that invoices can now be paid offline. For any offline invoice payments, you can simply click on the invoice actions button for that invoice in Paycadence and choose the ‘Mark invoice as paid’ option. This will create a manual transaction entry for your records. We have made some updates to our invoices. Invoice Payment Form: Line Items Invoice line items have now been added to invoice payment forms. This will allow your customer to see a complete breadown of everything on the invoice. 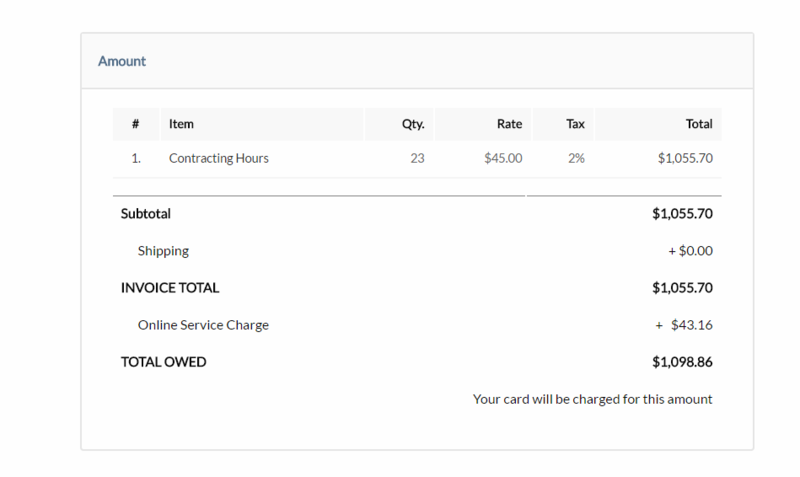 Prior to this change we were only displaying the invoice line items in the invoice email. Bug Fix: Paying Invoice with a Saved Card We fixed an error causing occasional problems when attempting to pay an invoice using a saved credit card. Invoice Actions – Descriptions Descriptions have been added for each possible invoice action, so users will have a better understanding of which option to choose. We have added a new feature to our custom payment forms. You can now add a dynamic service charge to any form in which the amount type is set to ‘custom’. This will allow you to recoup your transaction fees on payments where the customer or donor enters their own amount on the form at the time of payment. Depending on how you set up the service charge you can collect all your fees or just a partial amount, for situations where you may not want to pass on the entire transaction fee amount to the payee. The service charge option allows you to enter both a fixed amount as well as a percentage for each individual payment form. The amounts you enter are than applied to the amount entered by the payee using the formula provided by Stripe at this link. Use our Pass Your Stripe Fees to Your Customer Calculator to determine the fee amounts you would like to use for the service charge. We have released an update that allows users to setup payment notification emails. Go to Settings > Configure in your Paycadence account and you can enter any emails addresses that should be notified of a payment. Notifications are sent for all charges and refunds to any email provided in this section. As a reminder, customers are automatically sent both payment and refund receipts for any transaction where their email is present. Additionally, we recommend checking your Stripe account settings to make sure they are setup the way you want for email receipts and notifications. We have added a few new features to our customer receipts. Company Logo If you have uploaded a logo it will now appear in the heading of all receipts sent to your customers. Resend Receipts You can now resend a copy of the transaction receipt for a successful transaction. In order to do so open your transaction page within your account. Click on the ‘Actions’ button and Click the ‘Resend Receipt’ Button. The form that pops up will be pre-filled with the customer email provided at the time of the charge. You can leave it in place or change it if you need to send the receipt to someone else. View Receipts Online You can now view a copy of the transaction receipt for a successful transaction. The receipt is provided online by using a unique url to protect your customer’s privacy. To view an online copy of a receipt open your transaction page within your account. Click on the ‘Actions’ button and Click the ‘View Receipt’ Button. Email Delivery As an additional note we are currently using Sendgrid (Sendgrid.com) to deliver all our receipts to our users’ customers. Sendgrid is an email delivery service to ensure our emails end up in the recipient’s inbox and not in their spam folder. We have officially nominated the Giraffe as the Mascot/Logo of Paycadence. This has been an extremely important business decision and the choice of what image will represent the Paycadence brand in the years to come was not taken lightly. We spent a solid 5 minutes not only brainstorming but also making this grand decision. What animal is better suited than a giraffe to communicate to the human brain that it is in the business of accepting online payments? Phrased another way, when you think of getting paid what is the very first visual that pops into your head? Is it a Walrus? Is it an Elephant? Is it an Eagle? Is it a credit card? No! It is a Giraffe! That is why we chose the spotted and noble giraffe to represent Paycadence going forward. Our twitter profile has already been updated to reflect this exciting bit of news. The remaining dull and lifeless text-only Paycadence logos on our website which do not currently depict our new long-necked friend will soon receive the Giraffe-Upgrade-Addition. If you are reading this post and already see us flying the Giraffe logos on our website, then you are either living in the future or the past has passed on by.